The memo, dated 4 January and published in the pro-opposition Freedom and JollofNews newspapers, said that an “executive directive has been issued that all female staff within the government ministries, departments and agencies are no longer allowed to expose their hair during official working hours”. “All are strictly advised to adhere to this new directive,” it added. Some 90% of Gambians are Muslim. When Mr Jammeh declared The Gambia an Islamic republic, he said the move was in line with the West African nation’s “religious identity and values”. His critics said the declaration was intended to deflect attention from the poor state of the economy, including the rise in the price of basic commodities. Many Muslim scholars believe that Islam requires Muslim women to cover their hair in public. However, the requirement is not strictly adhered to in The Gambia. First Lady Zineb Yahya Jammeh has previously appeared in public with her hair uncovered. In November, the Gambian leader banned female circumcision, saying it was not required in Islam. 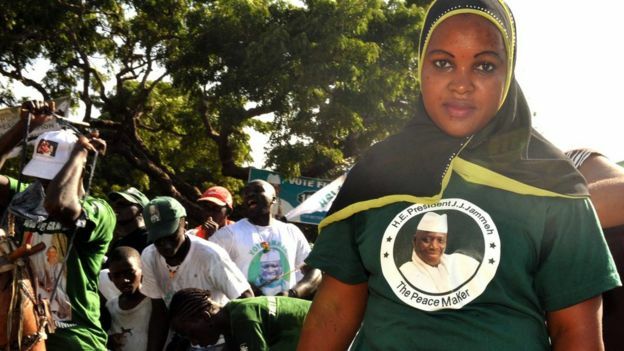 Mr Jammeh, who seized power in 1994 as a 29-year-old army lieutenant, is accused by rights activists of presiding over a brutal regime which is intolerant of dissent. The European Union temporarily withheld aid money to The Gambia in 2014 over its poor human rights record.